Congratulations to Garystar who came up with just about the same number we did for Friday's Fermi Problem soultion! Garystar, please send us your mailing address to physicscentral@aps.org and we'll send you a prize package of some Physics Central goodies! After eyeballing Rick Guidice's painting above, I assumed the diameter of the entire Stanford Torus space station was 1 km while the diameter of the interior of the 'doughnut' was 50 m. Since people and houses are seen only on one half of the interior, I considered it as a cylinder with no base or lid, and the height of the cylinder equal to the diameter of the interior. Using the formula for the area of a cylinder (2*pi*r*h), we get 2*pi*1000m*50m which gives us 160,000 square meters of habitable area inside the Torus. From looking at the painting, we see that houses don't account for the entire area of the station. I considered 40 percent of the area reserved for houses with the remaining 60 percent used for farming, schools, grocery stores, etc. Forty percent of 160,000 square meters is 64,ooo square meters. Assuming that the area of the average American house is 220 square meters, this gives us about 300 homes for one station. If each home were occupied by 4 people, then one Stanford Torus could house 1,200 people. The population of the Earth is about 7 billion. To fit all 7 billion on space stations, we would need just under 6 million Stanford Tori. There are 300 million people in the United States. To house them alone we would need 250,000 stations. What's more interesting than the number of cushy tori that we would need to house everybody - though it's a lot - is what's going on back here on Earth. Assuming, as we did above, that every person in the world occupies 55 square meters of space (a 220 square meter house divided by 4 people gives us 55 square meters) the world's population could fit in an area the size of Texas. That's amazing! Now, here's a parting thought for you to ponder in your free time. If we parked the stations one next to the other, we could walk across them to get to the Moon with millions of stations still to spare - unless, that is, you stacked them like quarters, in which case we would be 128 tori short. 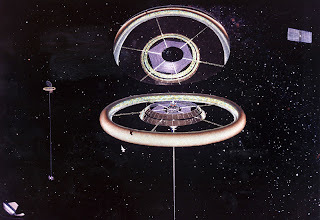 If you're intrigued by the idea of living in space, check out these other conceptual images of the Stanford Torus. Can Killing Trees Save the World?